The 3 Pillars of Effective Review Management - Fortune Marketing Inc. The 3 Pillars of Effective Review Management - Fortune Marketing Inc. When you look for answers to questions or problems you have, how do you start? Do you ask friends and family for advice and referrals? How often do you research online in search engines, Facebook groups, or business directory and review sites like Yelp or Angie’s List? I’m willing to bet you do this fairly often – nearly everyone does. And what do you notice first in the search results? Most of the time it is the Stars and Ratings for each business that shows up in the results. FREE Checklist to Get More Reviews! Get the Social Proof you need to get more leads with this simple, FREE 7 Step Review Management Checklist! YES! I'D LIKE THE CHECKLIST! Now, apply this to your business – what results do you see when searching for your own business online? How does your Review profile look and does it accurately represent your business? 92% of people trust recommendations from friends and family over any other type of advertising, as reported by Nielsen. Word-of-mouth and referrals are likely your best source of new business. And in the online world, reviews are the digital equivalent of word-of-mouth marketing. Reviews are the primary indicators of TRUST and CREDIBILITY in your business. Without them, you will get overlooked by your ideal customers. Ask for reviews from your best customers — consistently. Promote those reviews to grow your business. Why Do You Need More Reviews? Consumers are reading more and more reviews, they’re easy to find and take seconds to access. With mobile devices reviews are simply a few keystrokes away. BrightLocal’s Local Consumer Review Survey indicated that 85% of customers read up to 10 reviews before making a buying decision. And a lack of reviews can make businesses that serve their customers wonderfully virtually invisible online. Without a growing and positive reputation online, you’re missing the social proof consumers use before making purchases. And, your competitors are getting those reviews. Take a look at the example below. 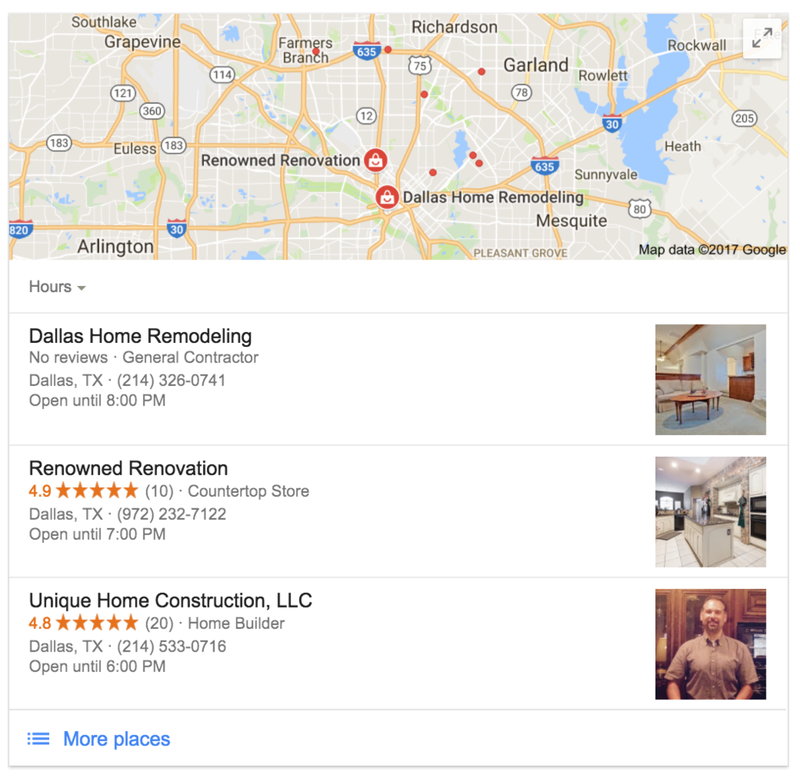 While one company has done a good job of Local SEO to get into the map results, which of these three companies is likely to get more calls? Probably not the one with zero reviews. 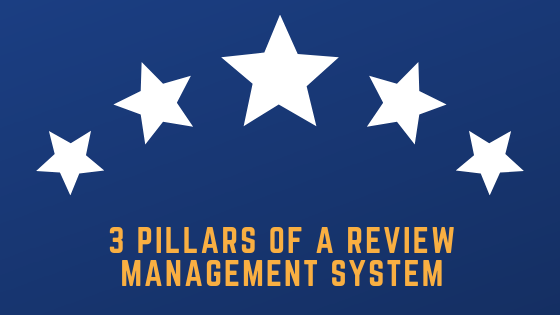 Why a Review Management System? Without a review management system, positive reviews are happy accidents and negative reviews are far more crippling to your business. Purposefully seek out positive reviews to reduce and eliminate the “gut reaction” reviews. Think about this — how often do you go out of your way to praise a business for a good experience? More often customers leave a review when they are unhappy. The ability to quickly respond to negative reviews to help make it right and show future customers that you do business in a positive light. What are your current reviews and ratings? Social media sites like Facebook and Twitter. Search engines like Google or Bing. Business directory and lead generation sites like Yelp, Angie’s List or BBB. 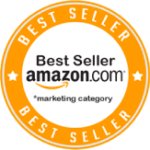 Specific industry sites such has HealthGrades, Avvo, etc. Most of these sites offer business profiles where businesses can claim their page to manage their listings, proactively publish content and manage their reviews. Claiming your business allows you to respond to both positive and negative reviews. How do you manage negative reviews? I’ve seen negative reviews happen for a variety of reasons. Spam posts can be common. Those are the 1 star reviews for no clear reason or jibberish comments. Most sites are pretty good about monitoring and taking those down. Disgruntled former employees. Upset employees can take reviews as an opportunity to take a swipe at your business. Most of the time what we’ve experienced with clients is that we have good success in getting those reviews moderated, or removed. Legitimate 1 or 2 star reviews. Negative reviews can happen simply if your business had a bad day. Sometimes it’s because team members did not follow your internal processes or protocols accurately and the customer had a bad experience. Or, customers caught you at a bad time and you delivered a bad customer experience. Or, customers had their own bad day. What’s key here is to accept that it’s a legitimate bad review. Your response, however, matters most in these situations. Should you respond to all reviews? You should absolutely reply to all legitimate negative reviews with apologies for the bad experience and offer to take the conversation offline. Have them call or come into your business and do your best to rectify the situation. Try not to have a back and forth conversation on the review site. This can appear as an argument and can cause damage instead of repairing the situation. The customer is already upset. Don’t argue points, acknowledge that they felt they had a bad experience and rectify it offline. Keep in mind that your response leaves a lasting impact that potential customers can read in the future to get a sense of how you handle business. The best defense against bad reviews is more good reviews. Remember, customers are most likely to review only when something has gone wrong. Be proactive about asking for reviews from your best customers. If you are not proactively asking, you are missing an opportunity. And the best online source of trust and credibility for your business is your reviews. Consistently ask your best customers for feedback, reviews and ratings. Keep your reviews current! Recent reviews indicate to potential consumers that your business is active and thriving. Implement an email drip or text message campaign (opt-in only of course) to reach your customers. Be cautious not to over contact but create a regular schedule. For example, on a monthly basis reach out to your best customers to leave you a review on the most important sites of your business. Be that Facebook, Google, Yelp, or whatever the most pertinent review sites might be. Over time this will build into a sustainable database of reviews that not only proactively tells searchers that you’re a great business to do business with but it will also help improve your search rankings and give you those 4 or 5 stars. Most importantly, you’ll have a solid defense mechanism against the occasional negative review because the overall average of your reviews will be far more positive. Now that you are gathering reviews, be proud and promote them! Incorporate the positive testimonials or reviews on your website and your marketing campaigns. Positive posts direct from other consumers are far more valuable to customers than a business saying they are “reputable”, “reliable”, or “high quality”. Publish your average star ratings AND consider making that part of your core marketing message. Reviews matters to people because when searchers are looking for a business to solve their problem they’re are looking for immediate information that helps them know, like, and trust a service provider. The higher ratings you are, the better opportunity you have to establish yourself as a credible provider to solve the kinds of problems that they’re having. It supports your claims. Start simply by familiarizing yourself with your what reviews exist for your business. Then start proactively asking for reviews from your best customers and prospects. Once you have them, promote! And, promote on all your marketing channels, both offline and online. This is NOT a one-time thing, top local businesses know that operating a review system is an ongoing component of a full marketing system. Do all of this consistently and you will see your online reputation sky rocket!